As I forced myself to take cold shower, my mind was going through the activities for today. I was more or less was very awake after the shower. A quick enthusiasm kicked in as I was drying myself (with a towel) in the bathroom. An almost silent hum of SP Bala’s “Keladi Kanmani” can be heard from my mouth. Just when I was about come out from the bathroom, I accidentally hit my elbow the wall, right at the nerve. Immediately, I was “electrocuted”. The stinging pain coupled with electricity-like surrounded my right hand. All I remembered is me kneeling down in pain and almost shout out in pain. It took almost 10 minutes to recover from the pain but my palm was numb. 3 hours later, when I was in the office, I could feel the pain at the elbow and some numbness at my palm. It has been a very long time since I was “electrocuted” this way. I was curious of the nerve and so I made a quick check on the internet on this. 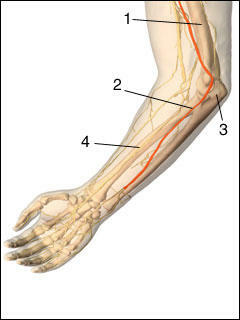 The nerve is known as “ulnar nerve”. This nerve functions to give sensation to the little finger and the half of the ring finger that is near the little finger. It also controls most of the little muscles in the hand that help with fine movements, and some of the bigger muscles in the forearm that help to make a strong grip. No wonder, when it hit nerve, I had numbness on my palm. Posted on 27 September 2005 6 December 2010 by B.JoePosted in HumanTagged Bathroom, Elbow, Keladi Kanmani, Nerve, Pain, Paresthesia, Ulnar nerve. Previous Previous post: Reunions – when to go for one? The same thing happend to me last night, i was playing a set in a small sask town when my band mate and i smashed into each other well his head stock right in the space in my elbow it hurt had to drop my axe and just sing along my palm is still numb i hope it goes away so far i am at one day later.